Although there are also pages covering Outdoor and Indoor Exhibits, I`ve included most of the Helicopter shots here, irrespective of the display location. The Mil ​Mi-8 is a twin-engine medium transport helicopter, designed in the early 1960s by the USSR as the successor to the piston-powered Mi-4. The first Mi-8 prototype, powered by a single engine, first flew in 1961 and the next, with two engines, took to the air the following year. The Mi-8 went on to become one of the world's most popular transport helicopters, chosen by numerous military and civilian operators across the globe. ​The type performed many roles including personnel and VIP transport, Search & Rescue (SAR), mine-layer, minesweeper and airborne command post. 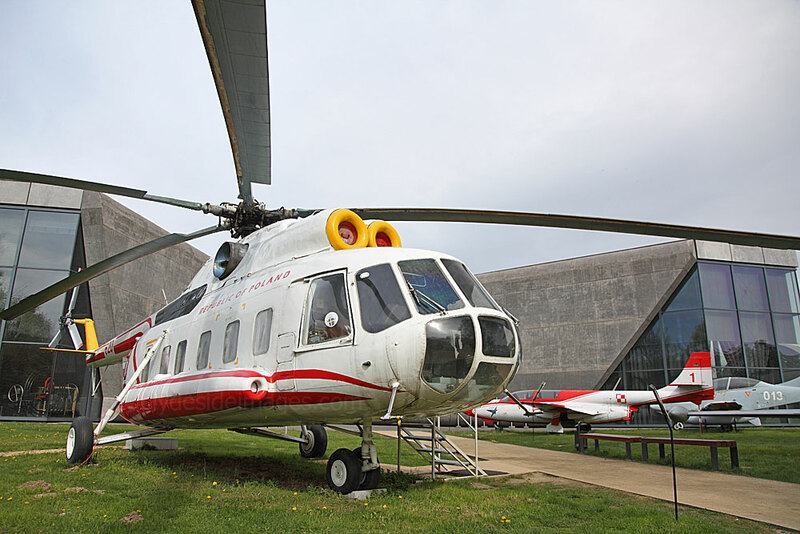 More than 9,000 were built and the production of the latest development continues, plus the Mi-14 amphibian helicopter is based on the Mi-8 design. In 1976 another version, the Mi-17 was developed (designated Mi-8M in Russia), powered by more powerful TV-3 engines, enhancing the helicopter's performance at high altitude, especially in hot environments, a helicopter that was widely utilised by the Soviet army during the war in Afghanistan. 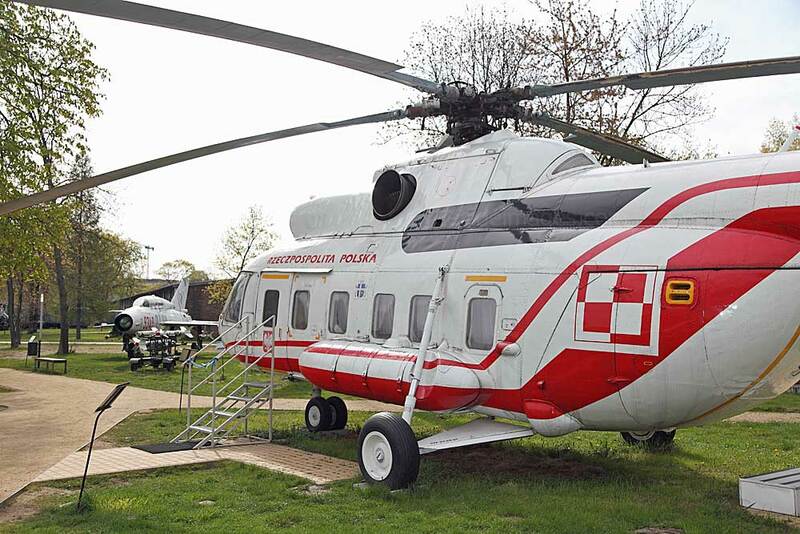 Polish military aviation has operated the Mi-8 since 1968 in the cargo, rescue, executive and passenger transport roles, and the Mi-17 since 1987. Three Mi-8s are also operated by the Police aviation unit. The example on display, number 10620, is an Mi-8 military VIP transport variant. 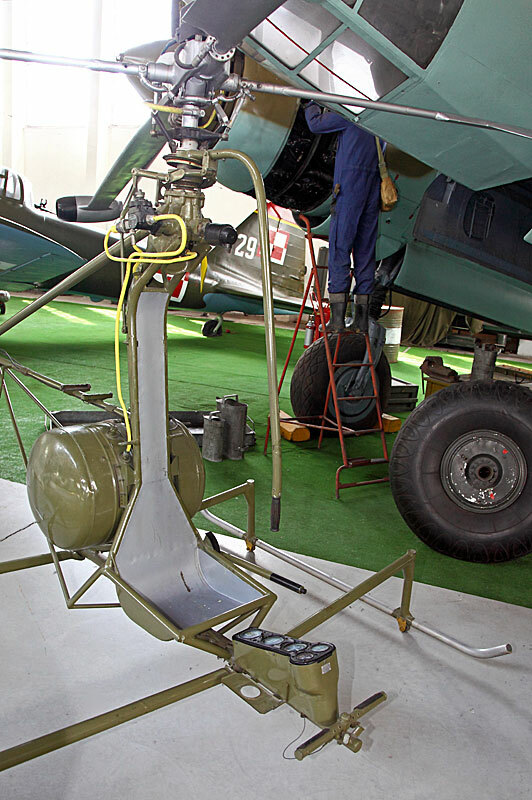 It was manufactured in 1973 at the Kazan Helicopter Plant and served with No. 36 Special Air Transport Regiment at Warsaw. 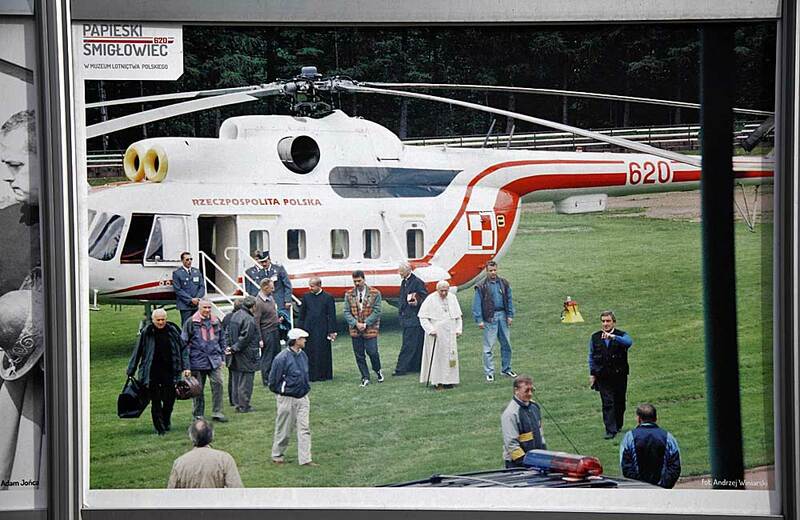 It was one of several Mi-8 used during Pope John Paul II`s tour of Poland. 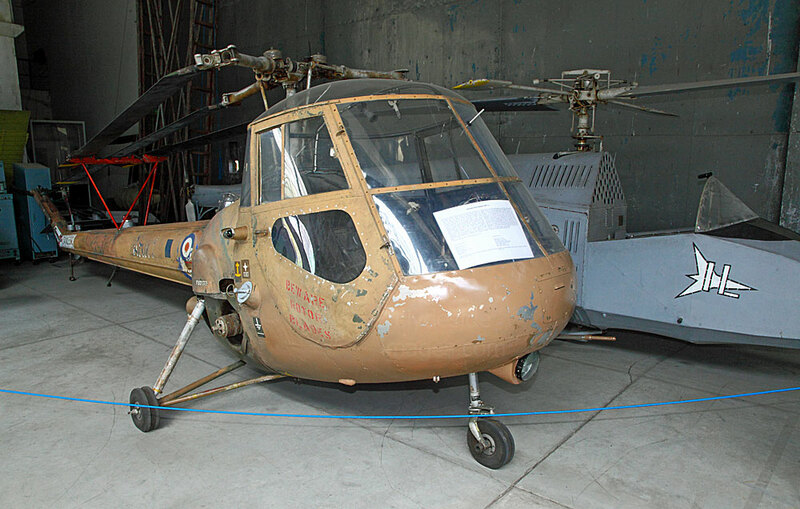 The helicopter was donated to the Museum in December 2009. WSK SM-1 (licensed Mi-1, NATO: Hare) SP-SAD. Below: The MIL Mi-4ME (NATO: Hound C) is is a radar-equipped version of the Soviet Mi-4, designed primarily for anti-submarine warfare (ASW), and as such became the first helicopter of that type in Polish naval aviation service. An additional role was to seek out and destroy enemy surface vessels. The crew consisted of two pilots and a navigator-operator. Due to the helicopter's limited payload, two machines were required to conduct a combat mission. One, acting as a submarine spotter, was equipped with hydro acoustic buoys (the "Baku" system) while the other was to attack enemy targets with depth charges. The Mi-4's ASW search equipment fared rather poorly due to high levels of noise and vibration. Worse still, the Mi-4M offered little for its crew in terms of survival in case of an emergency water landing. Any choppers that ditched would likely turn over and sink rapidly, leaving the occupants very little opportunity to escape. In 1964, an export derivative was developed and designated Mi-4ME. Poland bought 4 examples, which were operated by No. 28 Navy Rescue Squadron and formed an ASW flight. 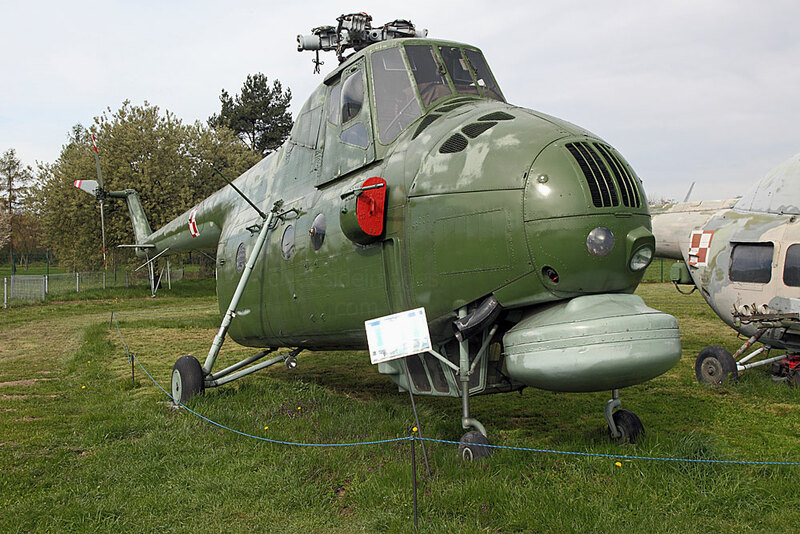 After they were withdrawn from service one machine, Mi-4ME number 617, was donated to the Museum. The Saunders-Roe (SARO) Skeeter (above) was a two-seat training and scout helicopter. The British Army ordered 64 Skeeter 6's, to be designated as the Skeeter AOP.12 (Air Observation Platform), and the Skeeter finally entered service in October 1956. Several Skeeter AOP.12s were also operated by the Central Flying School of the Royal Air Force. During the late 1950s, the Skeeter entered service with the British Army Air Corps, the German Navy, and the German Army. The Skeeter has the distinction of being the first helicopter to be used by the Army Air Corps. 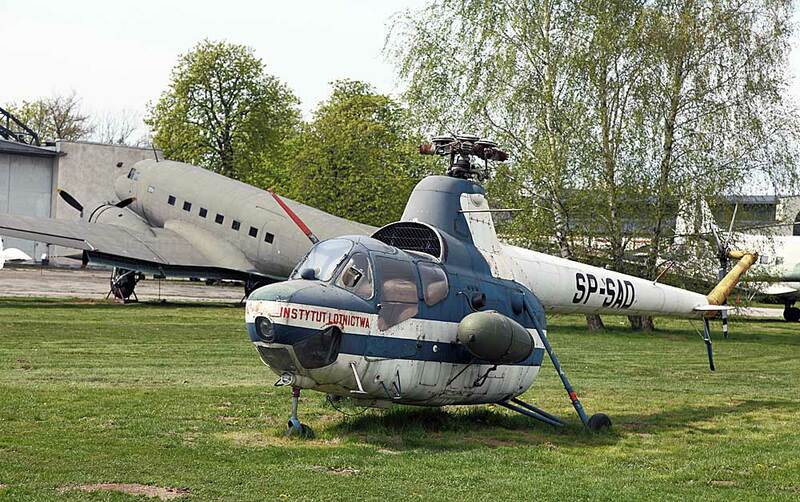 Left: This is the first viable helicopter to be built in Poland where research into a successful design began soon after WW2. 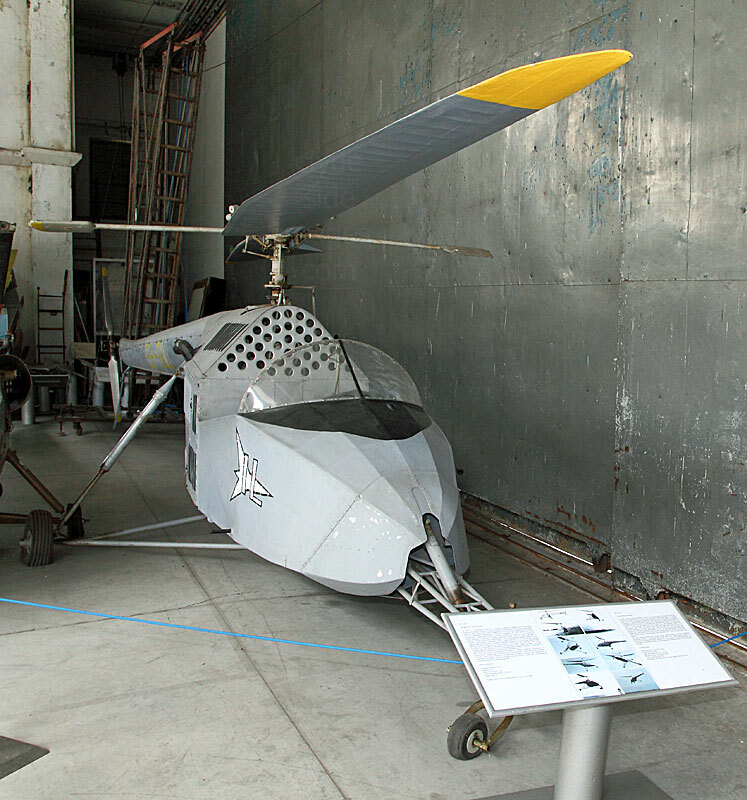 In 1949, the prototype of an experimental machine received the civil registration SP-GIL although, somewhat unusually, this helicopter was never given an official name. The main rotor, based on the American Hiller system, had two wooden main blades and two smaller steering blades. Such a configuration ensured self-stability and reduced the control force, which significantly made steering easier. A fabric covered fuselage had removable aluminium engine doors and the cockpit was made for two people, but practically the small helicopter was better flown single handed. For propulsion, a very good German Hirth HM 504 engine was chosen while the intermediate tail rotor gearbox was taken from a German motorbike. Airborne tests began in April 1950, but the design was flawed and after several breakdowns, flights were suspended and the type never went into production. By that time it was often referred to by the project`s workers as the BŻ-1 GIL (Bullfinch). Following a review, and the introduction of improvements in the construction, ground tests were carried out on the second prototype, which was remotely controlled as a precaution. In October 1958, the next accident, as result of an engine fault, occurred and soon after all tests were suspended. 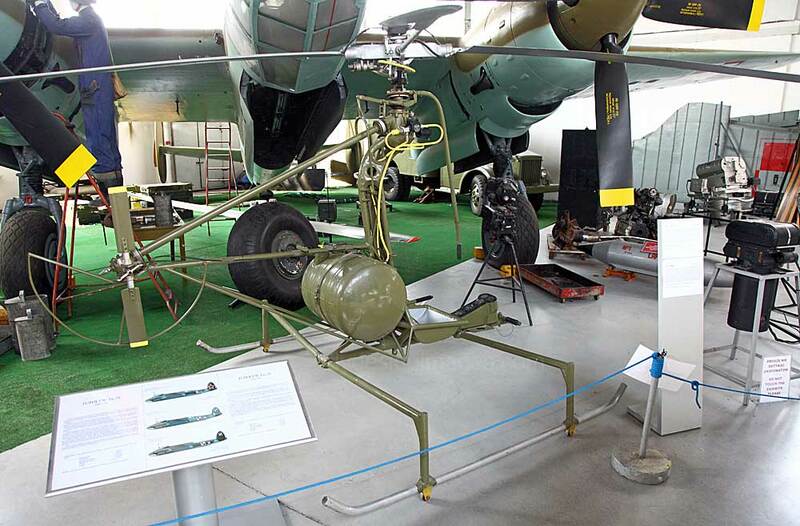 The `bumble bee`never flew and the last surviving prototype was eventually donated to the Polish Aviation Museum.